Written by: sarahwagner on October 4, 2014. 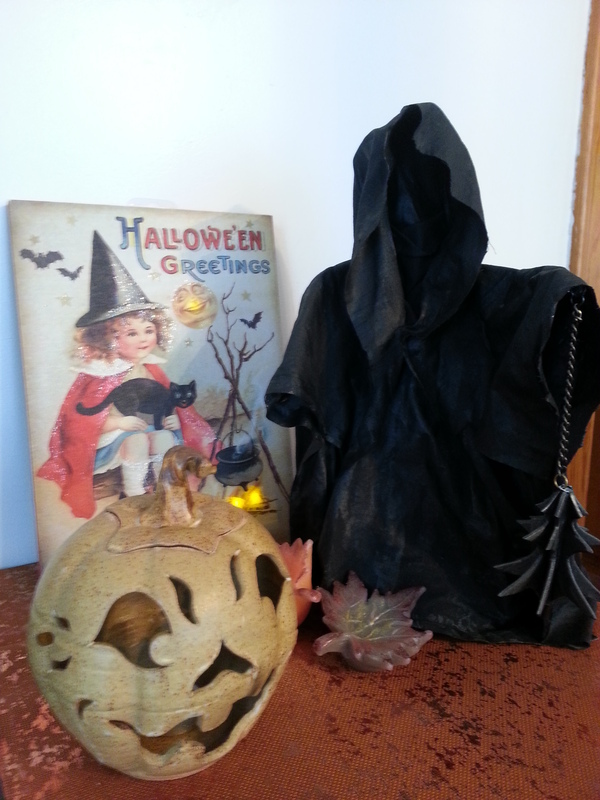 Every geeky Halloween display ought to have a Nazgul running amok! 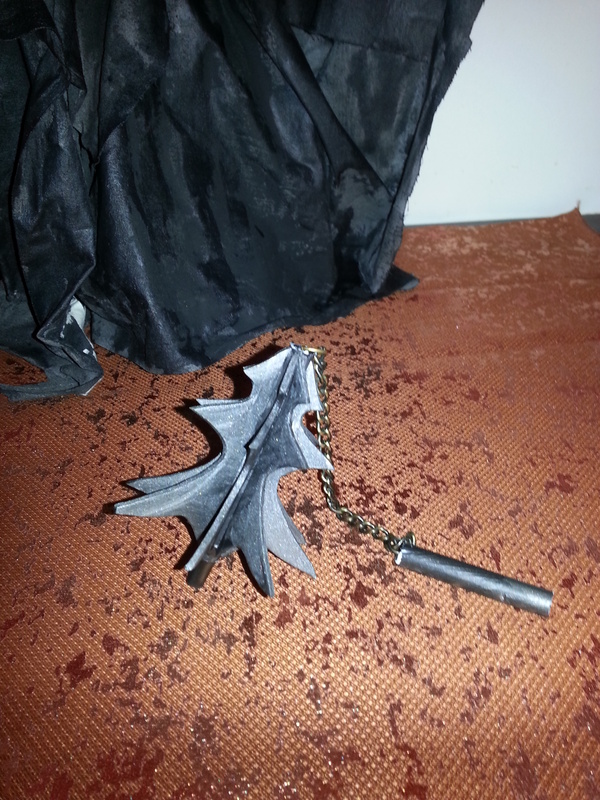 Though it is time consuming and messy, this Nazgul is pretty easy to make and only requires a few things that you might not have around the house on a daily basis. It may take anywhere between one and two days, but only about four hours work as most of the time is drying time. Fabric – a coarser fabric will get better results. I used the same cheaper coarse muslin fabric I use for pattern making. Do not use sheer fabrics except as a top layer. Do not use fabric that is so heavy it will limit the appearance of movement. If it’s in the clearance bin and it doesn’t feel slippery and you can’t see through it but can crumple it without resistance, it should work. 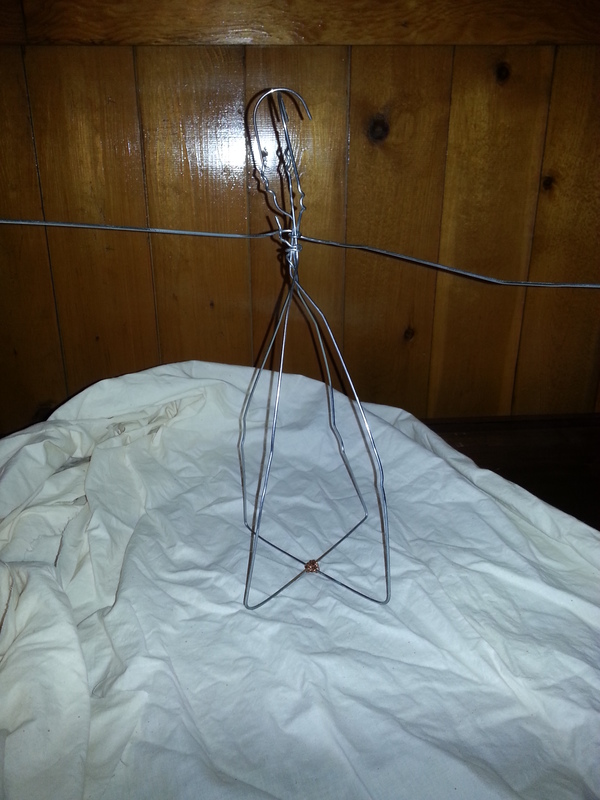 Unbend the hangers – use two to build the base form and one for the arms, use cutters to remove extra length. Use foil to create the head shape – make a tin foil ball around the hooks of the hangers both to held keep the shape under the hood and keep the hooks from getting caught up in things. Wrap arms in black electrical tape. Drape fabric over form to create the shroud. I did this shroud in two layers (repeating steps 4-6 until I was happy with it). Use the needle and thread where needed. I put a few stitches in the sleeves and in the hood, where I need the fabric to stay together. If fabric is light in color, put liquid starch in a jar with black paint, mix well. Paint fabric with liquid starch. Shape to desired shroud form. It is easier to shape the starched fabric when it is almost dry, but still tacky to the touch. I used crumpled wrapping paper to help form the shapes while the starch was still wet but removed it before it was dry so as not to have paper scraps stuck to the inside of the sleeves and hood. If you don’t like the color, add more paint to the starch or paint it again after the starch is dry. Please note, when you tint the liquid starch, it will dry lighter and it may take two or three applications for the fabric to have the color and rigidity you want. 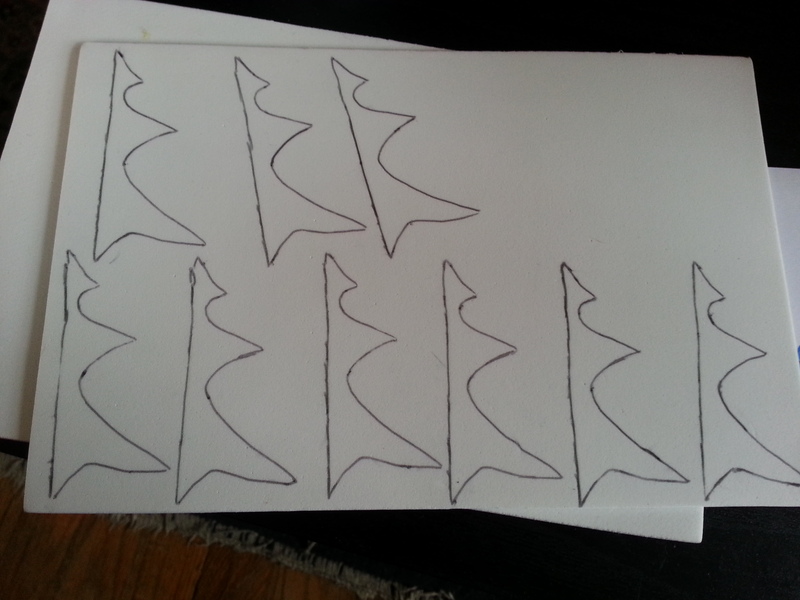 Draw stencil, trace onto craft foam (between 8 and 9 shapes needed) and cut out shapes. Take bic pen apart, keep barrel and the black tip of the pen, without the ink. Cut barrel to proper length to match the foam shapes. Keep shorter length for handle. Use hot needle tool to put small hole in both sections of bic barrel. Glue straight edge of shapes onto pen barrel and allow to dry. Paint flail and handle (left over bic barrel) black, allow to dry. 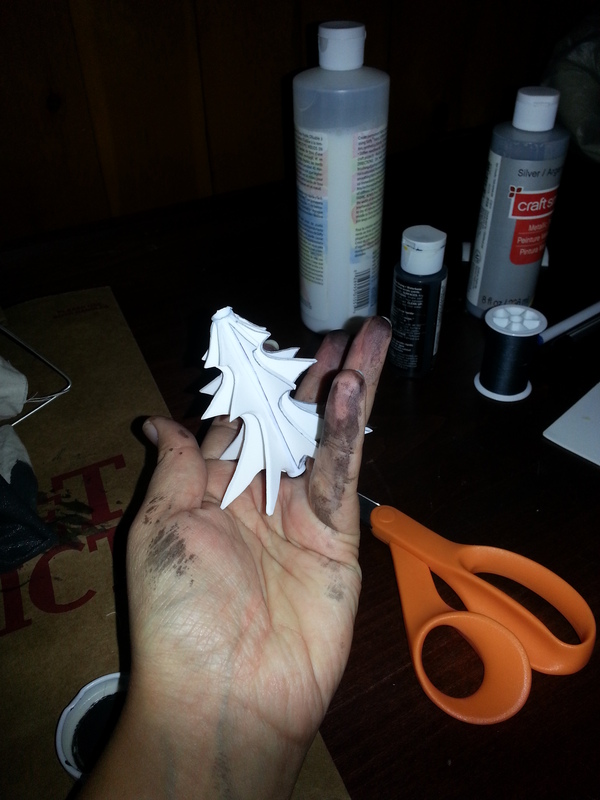 Mix silver and black paint together. Do not completely mix but swirl. This will give a metallic sheen to the flail. Paint Flail and handle. Allow to dry. Place black pen tip back into the barrel at the bottom of the mace. Using pliers, attach chain to both mace and handle. Put handle over the end of the wire arm and affix with electrical tape. Though this is a simple craft, it takes patience and is a bit messy. I recommend a drop cloth. The starch will wash off of skin without too much scrubbing. This particular Witch King is not waterproof and is not recommended for outdoors display. With modifications to the form and the shroud and without the flail, you have a Dementor. Trade out the flail for a scythe, you have a Reaper. If you make him smaller, I’d recommend using jewelry wire instead of the hangers and if you make him larger, use PVC pipe. The process is the same. If you make one, let me know in the comments, I’d love to see them!